I make one cent every day from ads on my blog, so I know it is going to be a great day when the blog makes two cents. This afternoon I noticed that my page views were significantly above average. I promptly checked my revenue for the day and felt like a billionaire when I saw that I had made $1.54! So what should I do with my new-found wealth? Invest? Splurge on a Vitamix? Grab two apple pies from McDonalds? I guess this is a conversation for my financial advisors. Easter was a ton of fun. 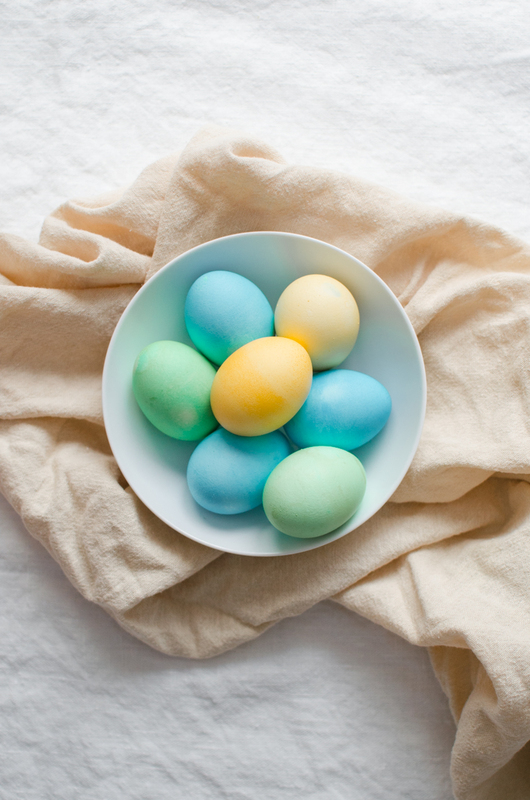 We experimented with making fried chicken at home and actually dyed some eggs!! There is a photo of our Easter eggs, taken right before they were turned into deviled eggs. The rest of the weekend was devoted to keeping little Ellie occupied by taking her on long walks. During our most recent walk we discovered that Ellie is actually a real dog: we threw a stick for her… and she fetched it. We were both blown away and beaming with pride. The days are longer now, but they feel short juggling work, the blog, photography, and so many other things. 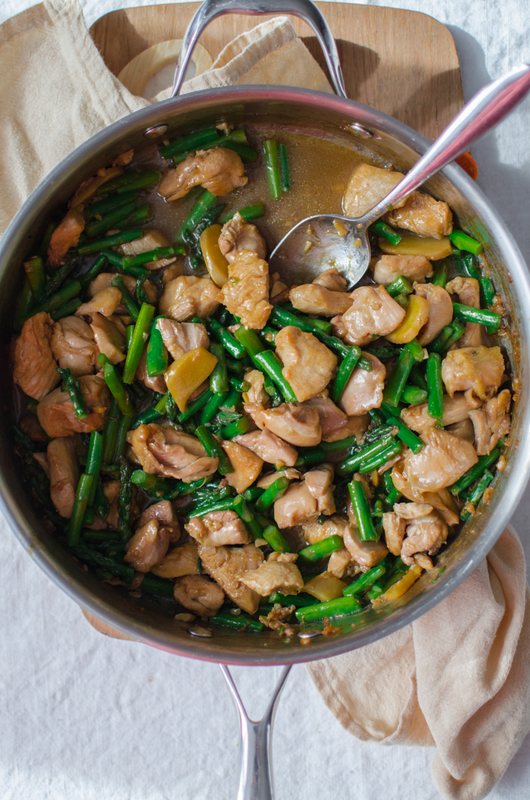 These days I’m extremely grateful for my quick and easy recipes like this garlic ginger chicken and asparagus. 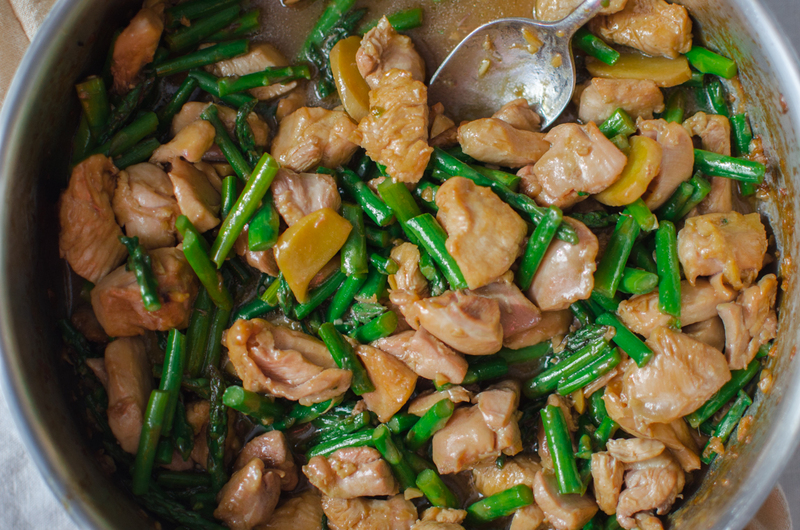 It covers the major food groups and is a great alternative to greasy Chinese takeout. From start to finish, the dish is done before you can even finish an episode of FRIENDS. 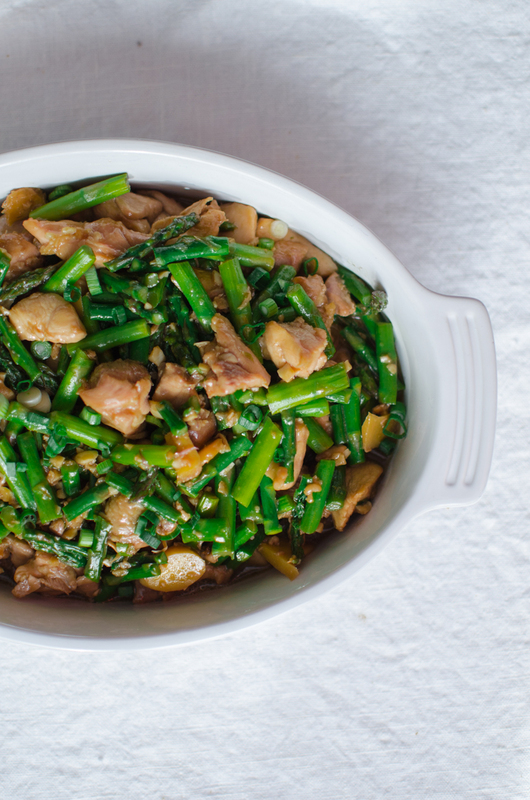 With a bowl of white rice, it is one of our favorite dinners at Casa Choi & Uhlig. In a large bowl, mix together the chicken, sugar, white pepper, and cornstarch. Heat up 2 tablespoons extra virgin olive oil in a large saute pan over high heat. Add the ginger and stir for about 30 seconds. Add the garlic, and stir for another 30 seconds. Add the chicken and saute for 3 minutes, stirring constantly. Add the rice wine and soy sauce, followed by the asparagus. Saute and stir until the asparagus is tender, about another 3 minutes. Plate, then top with green onions. Serve with white rice. 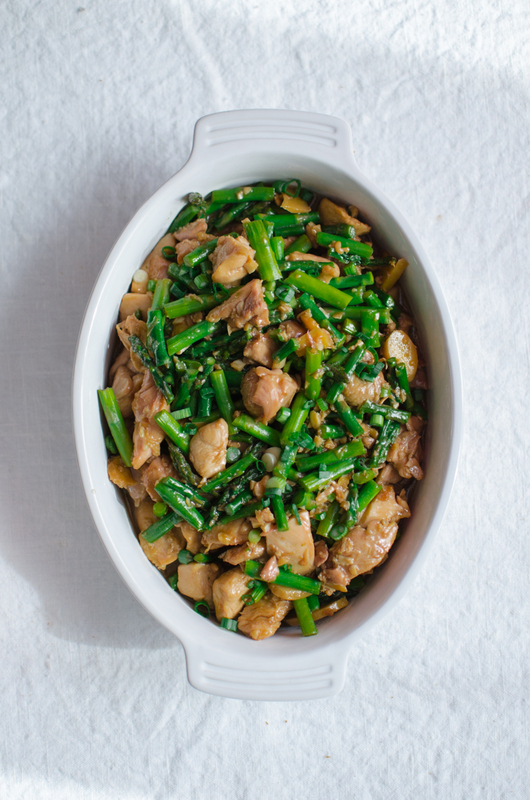 This entry was posted in Entrees and tagged asparagus, chicken, Chinese, easy dinner, garlic, ginger, stir fry. Hi Connie, I missed this blog, this looks great! I believe my new stove will be connected today so who knows, this may be the first dish I make! Hi again Connie, does this have yellow pepper in it? What are the larger yellow pieces? If it’s ginger, then I’m confused about the small, thin strips. thanks! Those larger yellow pieces are ginger (: The recipe should say flat discs, not thin strips! I just updated it! I happened upon your site quite by accident but I am so happy that I did!! Your recipes are wonderful and your presentation and photo layouts are great! I am sharing you with all my friends.